Allen’s eldest daughter, Barbara, and her younger brother, Frederick, both have childhood memories of their family making a trip to see what she remembers as a life-sized crucifix that their father had made for the Kershaw Estate’s St. Francis Chapel in Marlborough, New Hampshire. Barbara remembers being very proud that her father had done that impressive work. Probably just eleven years old at the time, it must have looked huge seen hanging on the outside wall of the chapel overlooking the peaceful waters of Stone Pond. The chapel and the crucifix have been well cared for on this picturesque country property. Weekly summer Episcopal services are still held on Sunday and weddings are frequent occurrences in the tiny Episcopal sanctuary by the water. 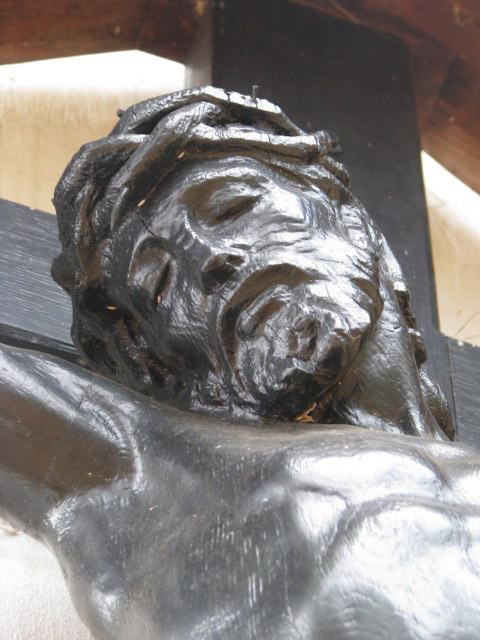 The crucifix is carved from two slabs of oak glued together to prevent cracking and warping, preserved in a dark finish. The arms have been carved separately, attached in vertical joints. It hangs on the exterior of the curved wall of the apse that houses the altar on the interior. It is presumed that it was detached in the winter and brought inside to protect it from the weather and vandals when the estate was closed up in the off-season. The figure is flat on the back side providing a secure surface where it is attached to the cross. One account in an addendum from 2006 (p.166) to Stone Pond : A Personal History by William D. Eddy (1982) relates the comical story of how, while doing repairs, a short relative of Mrs. Kershaw had to stand on a Bible on the altar to “take the big Christ figure down” to remove a light fixture. Although it now hangs outside, it must have been inside the chapel at one time. Looking at the figure, you would never guess that this wooden work of art had been outside for 84 years! The grain of the wood is deep in places and birds have built their nests in the protected cross behind Christ’s head, but otherwise it is in excellent condition. 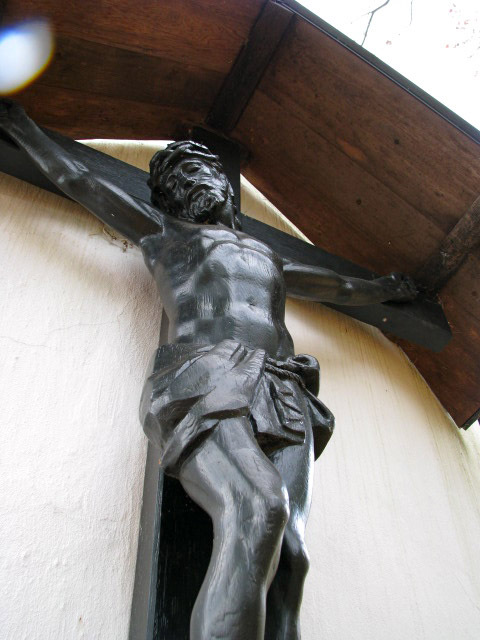 The figure hangs on a simple dark wooden cross under a small protective gabled roof, resting there regally and honorably. 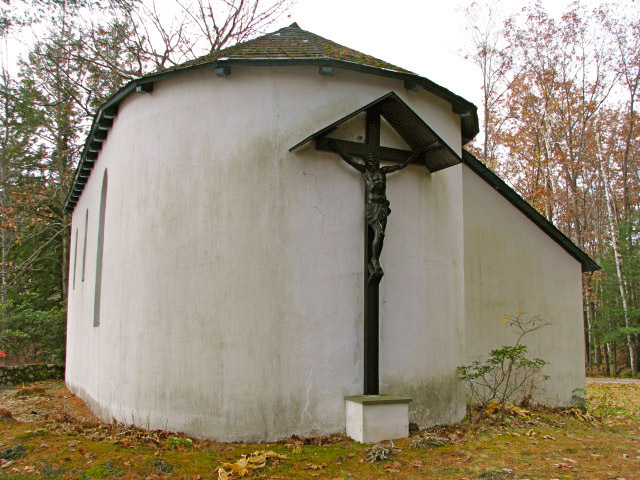 The base of the cross sits on a square-sided, bluestone-topped cube, the whole mounted on the outside of the white-painted curved wall of the apse of the tiny chapel reaching from just under the curved roofline to the base that rests on the ground. The face is peaceful, not a tortured rendition. Standing facing the carving on the outside, one sees to the left, the whitewashed sidewall of the chapel with its arched window frames painted a dark bright lapis blue. The woods are past and behind it with the pond and the open sky to the left. As would be expected of Allen, the anatomy of the figure is beautifully portrayed. The hands are closed around the nails. The forearms are slim rather than muscular and without bulk or the appearance of contraction. The tendons of the wrist and biceps are pulled taut, showing the strain on the arms of hanging from the hands. The knees are slightly bent, the right one a bit in front of the left to match the right foot nailed to the left. The muscles of the thigh are anatomically defined, but not detailed. The position of the torso is facing straight forward, necessitated perhaps by the outstretched arms pinned with large square-headed nails at the palm. The head is lowered toward the right shoulder (and toward the waters of Stone Pond) so that the view of the figure, standing at the water’s edge is interesting and artistic. Looking upon the peaceful handsome face, there is much detail compared to the simple treatment given to the rest of the figure. There is calm and beauty in the form. The draping of the cloth around the hips is classical in style. The overall effect is of a slim, fit young man, finished with his work and sleeping peacefully. The toes have been broken off and smoothed flat and the whole carving has been preserved with what looks like a thick dark glassy weatherproof stain. The wood grain is especially visible on the abdomen and face, the contours running with and accentuated by the grain of the wood. The torso runs with the vertical grain of the trunk wood and the forward knee appears to have been the collar of a branch. This lovely natural scene would certainly please St. Francis, the Christ and the sculptor, a fitting setting for a surprisingly active little summer chapel up in the woods of Southern New Hampshire. The crucifix is wonderful. It\’s good condition however is due not so much to it being brought inside as much as one of the Hale did some extensive repairs about four years ago. The Kershaws have long since gone but the main house is owned by the Ferranti\’s of Boston camera fame. I believe the chapel upkeep is by the Diocese of New Hampshire. If you give me some information on Frederick W. Allen, I could include it in the next addition to the Stone Pond book. How did he come to know the Kershaws etc. The bird\’s nests are a nice addition that I myself have seen many a times. I would love to share information. In addition to the Crucifix, he sculpted the bas-relief lunette of St. Francis and the Wolf, the original St. Francis garden statue and a marble bust of Francis Kershaw. I have a copy of a letter from his widow praising the sculpture. I probably have more information than would be appropriate to include here. Also, Allen\’s student, Adio diBiccari, was a regular guest of the Kershaws. Perhaps we could meet in Marlborough.